The sun has been snapped emitting three powerful blasts of radiation in recent days, causing some disruptions in the Earth’s atmosphere. If strong enough, these solar events can interrupt GPS and communications signals around the world. Solar flares are brief eruptions of intense high-energy radiation from the sun's surface. However, fear not, as “harmful radiation from a flare cannot pass through Earth's atmosphere to physically affect humans on the ground,” NASA says. 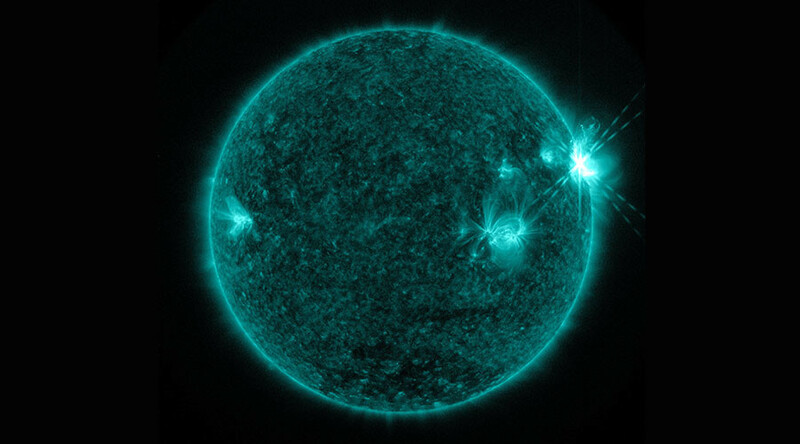 The flares sprang from the surface of the sun on Sunday and Monday. Images of the phenomenon leaping out from the sun’s surface were captured by NASA’s Solar Dynamics Observatory, which constantly watches our galaxy’s glowing orb. The three flares were all classified as ‘M-class’ eruptions. M-class flares are a 10th the size of the most intense flares, which are X-class. Western Europe and the east coast of the United States and Canada were most affected by the communications disruptions. A strong enough flare could seriously affect electronic communications on Earth, potentially shutting down air travel and satellites. The phenomena were first observed in 1859 when the enormous ‘Carrington event’ was reported by British astronomer Richard Carrington. The flare was so powerful it could be seen with a naked eye, and knocked out telegraph systems in Europe and the US. In more recent times, the largest flare came in November 2003 and was estimated to be an ‘X28’ flare. The number provides more information about a flare’s strength. An X2 is twice as intense as an X1, an X3 is three times as intense, and so on. So an X28 is a staggering 28 times as intense as an X1. The latest batch comprised all M5 flares.